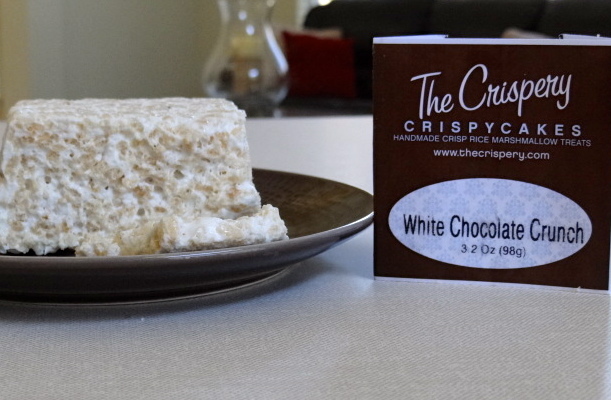 Do you think marshmallow crispy rice treats are just for kids? Me neither. I still love that combination of crispy, creamy, sugary awesomeness. So does Vicki Mate. She is creator and owner of The Crispery, purveyor of handmade, gourmet crispy rice treats. Vicki grew up loving marshmallows so much that creating imaginative marshmallow crispy rice treats became her life’s work. Her creations are not those of your childhood; think marshmallow crispy rice treats at the Ritz-Carlton. Just as you traded up from the circle-shaped canned spaghetti of your youth to handcrafted pasta with bolognese, you can upgrade to Vicki’s rich, sophisticated crispy rice treats. I have a serious weakness for white chocolate, so the The Crispery’s White Chocolate Crunch Crispycake was my first choice. Marshmallow cream lends a fluffy, airy texture to any crispy rice treat, but white chocolate adds more creaminess and depth of flavor than the back-of-the-cereal-box recipe could imagine in its wildest dreams. I probably could have eaten the entire Crispycake in one sitting, except for the nagging thought that it might contain my calorie allotment for the entire week! So what could be better than these White Chocolate Crunch Crispycakes? Having more flavors to try! We haven’t tasted them yet, but Vicki has many varieties available: peanut butter fluff, cookies & cream, coconut, creamy caramel and marshmallow fluff, banana chip, chocolate caramel and more. Specially decorated Crispycakes would be perfect for weddings, showers, graduations, or sporting events. They are available at a crazy number of retailers, and also on The Crispery’s website. What else is there to say about Crispycakes? Find them, eat them, love them!